College football is quickly approaching -- we’re 22 days away from the Gophers’ season opener on Aug. 30. So, with that in mind, I’ll take a look at Minnesota’s 12 opponents by asking five questions to a beat writer covering that team. Today’s installment is Game 12, Wisconsin. 2017 record: 13-1, 9-0 Big Ten; lost 27-21 to Ohio State in Big Ten Championship Game; beat Miami (Fla.) 34-24 in Orange Bowl. 1. A Heisman Trophy candidate at running back. An offensive line that might be the nation’s best. A quarterback entering his third season as a starter. Is this Badgers team good enough to contend for the national championship, and if so, what must happen? I definitely think Wisconsin’s offense will be good enough for them to compete for a spot in the College Football Playoff -- but the Badgers will need their defense to step up and hold their own after losing several starters from last year’s team to remain in the mix. I am optimistic about the offense in part because of the factors you mentioned, but also because the Badgers should have one of the deepest groups of wide receivers and tight ends in recent program history. 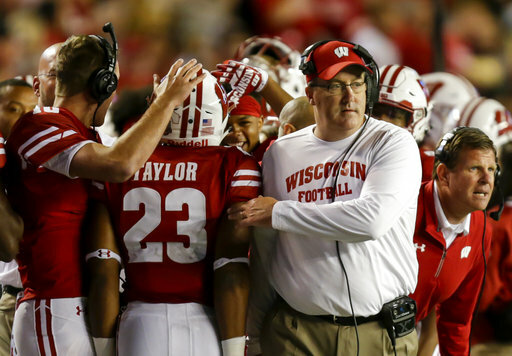 A lot depends on if the first team can stay healthy, but there is a chance that this offense averages close to 40 points per game this season -- something the Badgers haven’t done since now-head coach Paul Chryst was the team’s offensive coordinator in 2011. If the Badgers can take that step forward on offense, it should make up for a bit of a step back on defense, but they can’t afford for the bottom to fall out of that unit if they want to contend for a spot in the playoff again. 2. With eight starters lost on defense, is there enough returning depth and talent to match last year’s unit that allowed only 13.9 points per game (first in the Big Ten, third nationally)? That’s a great question -- and one I think the Badgers would have felt a little bit more confident about at the end of April instead of in the run-up to the season. There is definitely a depth concern on the defensive line right now, in part because two projected starters at defensive end appear to have suffered been injured over the summer -- with one (junior Garrett Rand) expected to miss the whole season and the other (sophomore Isaiahh Loudermilk) expected to be back after nonconference play. Rand and Loudermilk were the only defensive ends left on the roster who had serious in-game experience for UW, so now the coaching staff will have to go back to the drawing board. They have a few younger options who are definitely talented, but the pressure will be on them in the fall to get ready to hold their own in the trenches. The other big question mark is at cornerback, where the Badgers need to find two new starters (and a reserve option or two) from a group of talented underclassmen. With the exception of sophomore Dontye Carriere-Williams, Wisconsin’s cornerbacks have yet to see much game action for UW -- but it’s a confident and athletically talented group. They seemed confident that they will be able to surprise people this fall -- but opposing offenses are still going to try and pick on Wisconsin’s cornerbacks until they prove themselves. It all adds up to a group that I think can be a good defense again, but I doubt that they will match the statistical success of last season’s group. I have thought that about previous UW defenses and been proven wrong in the past, but this is a new level of personnel turnover for the Badgers to sort out. 3. The nonconference schedule of Western Kentucky, New Mexico and BYU isn’t daunting. Could that haunt the Badgers when it comes time for the College Football Playoff selection committee to pick its four teams? I would say there’s a good chance that Wisconsin’s nonconference schedule could come back to bite them, but part of that depends on how (or if) BYU bounces back from last year’s step backward. Losing the Cougars as a top-tier nonconference game is a bit of a bad break for UW -- they scheduled that series back when BYU was chugging along at around nine or 10 wins a season, but the Cougars looked toothless in 2017 when the Badgers played them in Provo. The one upside for Wisconsin this year compared with last year is that their Big Ten schedule has a little more to point to. They draw both Michigan and Penn State from the Big Ten East (with both games on the road) and their other three road games (Iowa, Northwestern and Purdue) look to me like the teams they will need to beat to secure another Big Ten West title in 2018. I’m sure the Badgers would prefer to have some of those games at home this year, but if they can take care of business they could make the case that their path was a little bit more difficult. … I could see the Gophers winning Paul Bunyan’s Axe back from the Badgers if UW gets hit with the injury bug at a few key spots on the offensive side of the ball. Wisconsin’s quarterback depth is better than it was a year ago, but behind Alex Hornibrook there’s only one player who has played in a game for the Badgers -- and when he was on the field last year it was in mop-up duty. And if Wisconsin struggles to regain their footing on defense after losing so many starters from last year it could open the door for another team to try and get the Badgers caught up in a shootout -- but I think it is too early to say if the Gophers will take enough of a step forward on offense to make that a possibility. They have some impressive talents like Tyler Johnson and Rodney Smith, but I think their offense needs to have another weapon or two emerge to keep defenses on their toes a bit more.